Are you seeing an error when you try to use Elementor that states: 'Preview could not be loaded'? This is one of the most common errors on Elementor, and usually, it is quite easy to fix. 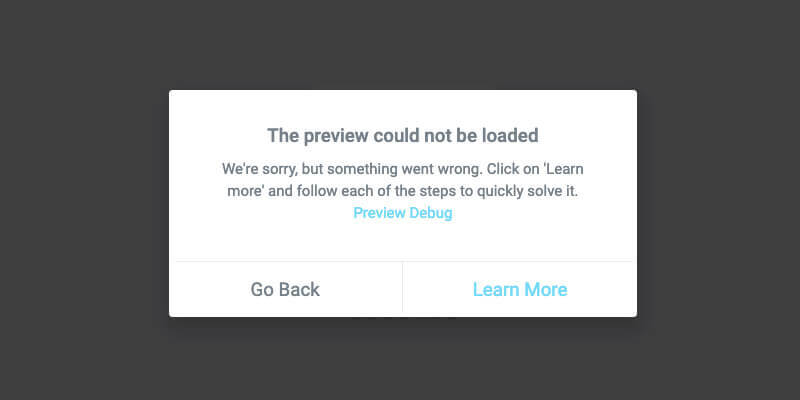 Since the error doesn’t give any other information, many beginners find it quite frustrating. In this article, we will show how you can easily fix this issue and get back to designing your website with Elementor. Note: If this message is received on a WooCommerce template or an archive page, such as the Blog page, this is normal and in this case, please use the WooCommerce Builder or the Theme Builder instead of trying to directly edit these pages. 1. Deactivate plugins. Try to deactivate all your plugins besides Elementor and Elementor Pro. If it solves the issue reactivate them one by one to find the culprit. 2. Make sure the theme files exist. If no theme is available, go ahead and install or re-install a theme. 3. Switch theme. Switch to a default theme of WordPress such as Twenty Sixteen or Twenty Seventeen. This helps rule out an issue with the code of the theme. 4. Check the structure of your permalinks. Try to save your permalinks one more time. Also, try to change the permalink structure to "Plain". Some servers do not allow to write to the .htaccess file and as a matter of fact, you cannot always modify your permalink structure and edit with Elementor. 5. Edit in incognito mode with your browser. This rules out an issue with an add-on or with the browser cache. In Chrome, at the top right, click 'More' and then 'New Incognito Window'. A new window appears. In the top corner, check for the Incognito icon indicating you are in fact in incognito mode. Now, navigate back to Elementor and see if the error persists. You should also make sure no add-ons are working in incognito mode and possibly try a different browser altogether. 6. Check conflicts with membership plugins. Check your permission on pages built with Elementor and membership plugins. 7. Solve possible theme conflict. Contact the support of your theme to make sure that the WordPress Default Loop is used in your layout. 9. Verify that you do not have a redirect on the page. 10. Solve hosting issues. Verify with your host provider if your WordPress install includes the .htaccess file. If your .htaccess file is missing, check out this link to regenerate. Also, check with your hosting company if your server erases the PHP $_GET variable. 1. You may have a corrupt .htaccess file. Download your current .htaccess file to save as a backup. Then delete it from your server. Visit your site and a new default .htaccess file will automatically be generated. If this solves your problem, look at the .htaccess file you downloaded to determine if there is any code within it that needs to be corrected. 3. This can be due to a security plugin. To sort this out, activate the learning mode of the plugin or contact their support. 4. This issue can also be due to the firewall of your server, such as mod_security, so this has to be checked with your hosting company. 5. Another plugin may be causing a conflict. Deactivate all plugins except Elementor. If the problem clears up, you know that another plugin is the problem. Reactivate each plugin, one at a time, testing your site with each reactivation. Keep testing until you find the plugin that is causing the failure. Get in touch with that plugin's developers to request assistance or use another plugin with similar functionality. If you are receiving 401 errors, you are attempting to access a page that requires authentication. If the page shouldn't be asking for authentication, contact your host for help in removing the authentication requirement or check any security plugins you may be using for options to turn this off. If you are receiving 500 errors, click here for the debug procedure. If you are not able to solve the issue following any of these steps, we suggest you raise the issue in the Elementor Community in Facebook. If you have our Pro version, you can send us your website login details and our support team will try to pinpoint the cause and fix it.